Gregory Ferrell Lowe and Christian S. Nissen’s edited volume Small Among Giants. Television Broadcasting in Smaller Countries focuses on the topic of television broadcasting in small countries regarding media policy and company strategy. The volume consists of nine chapters which provide a collection of different perspectives on regulatory, economic or industrial conditions of television broadcasting. Although the volume seems to lack a wider theoretical foundation (except from “‘small state’ theory”, 21), this is compensated by the variety of theoretical and methodological approaches the authors use in the chapters. Quantitative as well as qualitative approaches can be found for analyzing television broadcasting in small countries. The book presents separate case studies which address the overarching hypothesis of the book that “[S]ize is of fundamental importance for understanding how broadcasting works, and why” (8). The aim of the book is to show why and how size matters for policy making and in strategic planning (16) and “to diagnose characteristic challenges and opportunities for television broadcasting in smaller countries” (8). The ambitious number of research questions (7/8) – clearly stated and possessing high validity – adds in my opinion fruitful perspectives to the discussion. The book takes on the challenge of a comparative perspective, e.g. the comparison between larger and smaller countries. Most of the countries taken into consideration are European countries where public broadcasting is present; although comparisons to countries like Canada, New Zealand, Taiwan (Jackson et al. ), Japan and the US (Berg) are also taken into account. The relevance of the publication lies in the questioning of the ‘one size fits all’-presumption. With good reason, the editors and authors of the book hereby question the assumption that “[…] one policy fits all, or one model is suitable everywhere, […]” (29), whereas the emphasis lies on media law and policy making as well as strategic planning. As the editors themselves note they excluded the perspective on audiences (and although it is always somewhat unfair to criticize authors for what they did not attempt to do), Small Among Giants is missing this perspective on audiences in smaller countries. In this respect however, the chapter by Jackson et al. provides inspiring thoughts to a model of comparative research taking into account the socio-cultural contexts of television broadcasting in different countries (96/97). What is striking about the chapters is how well they relate to each other; all of them address the overall topic from their own perspective without discrediting other approaches. Interestingly, however, although they all account to the above mentioned hypothesis of the book, there are many findings that suggest that contemporary comparative research may lie beyond country borders. While Lowe & Berg & Nissen plausibly argue that smaller countries have a smaller market and thus rely more dramatically on an increased level of regulatory intervention than bigger countries (33), other chapters such as Hanretty’s find that size is not necessarily a key determinant (177). The editors themselves note that “[T]ransnational media corporations require analysis beyond country size, […]” (10) and Hill & Steemers conclude that “[…] success in formats is not only an outcome of country size but is more connected to the ability of companies to operate globally, which secures the capacity to roll out ideas quickly.” (211). In the light of this, one has to ask if country is in fact still the ‘right’ unit of analysis (for a methodological reflection of cross-national comparative media research see Livingstone 2003). How does policy making and strategic planning take place when transnational and national processes occur simultaneously? This observation calls for a redefinition of comparative research methodology; Svendsen argues in this sense as follows: “For their part, media policy research needs to focus on the transnational character of the single market and avoid practice of relying on classic country-by-country analyses, which very often don’t connect or add up to anything generalisable.” (161). 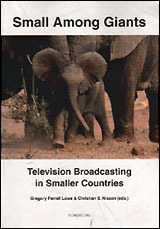 Nevertheless, Lowe and Nissen present an inspiring volume of illuminating insights into television broadcasting in smaller countries. The volume shows why size matters, while at the same time conveying desiderata for a ‘new’ comparative methodology which is able to tackle the phenomenon of increasing transnational and -cultural trends in television business, law and policy. The volume in my view thus possesses a high practical value for policy makers and industry professionals, particularly in the European context, as well as for comparative media and communication scholars. Livingstone, S.: On the Challenges of Cross-National Comparative Media Research. In: European Journal of Communication, 4, 2003, S. 477-500. Miriam Stehling is a research fellow and Ph.D. candidate at the Institute of Communications and Media Culture of Leuphana University Lüneburg, Germany. Her current research project focuses on the topic of transcultural television formats and their audiences in different cultural contexts.